Crater Lake is a caldera lake in south-central Oregon in the western United States. 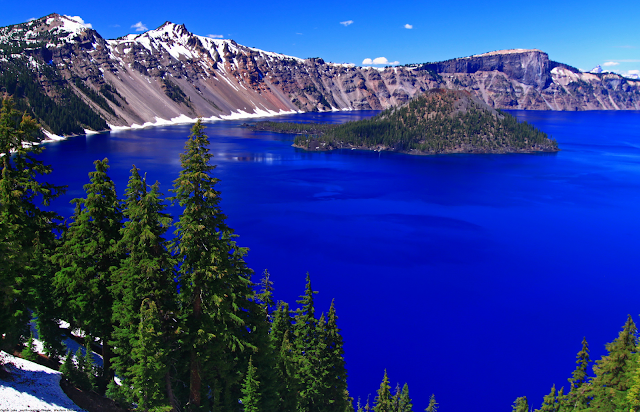 It is the main feature of Crater Lake National Park and is famous for its deep blue color and water clarity. The lake partly fills a nearly 2,148-foot (655 m)-deep caldera that was formed around 7,700 (± 150) years ago by the collapse of the volcano Mount Mazama. There are no rivers flowing into or out of the lake; the evaporation is compensated for by rain and snowfall at a rate such that the total amount of water is replaced every 250 years.